The Dogon of Mali is a fascinating and mystifying people. They share an ancient and rich history filled with legends of the birth of their people and other fabled occurrences. The Dogon have stylized important ancestral figures and created unique symbols which focus on their beliefs giving life to such historical events. Some scientists believe that their astronomical knowledge, numerical system and cognitive though far exceeded what was thought possible of people living in ancient times. Others are giving credit to the Dogon as being the forefathers of Egyptian hieroglyphics based. At present we are still far from appreciating the secret wealth of their hidden knowledge. Artistically they are famous for massive granary doors, towering wooden ladders and numerous ceremonial masks. 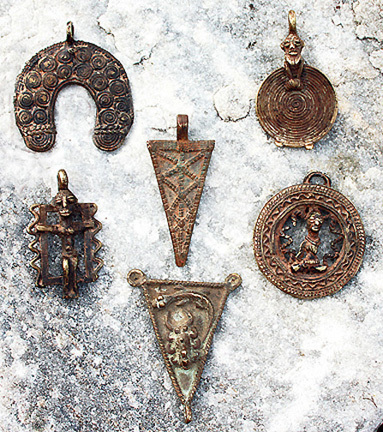 The Dogon people ever prideful of their important past have transferred such ancestral figures and symbols onto large bronze pendants that are worn daily. These are older hand crafted selections.